The Sny Island Levee System in Illinois is one of 10 levee systems that have exceeded their authorized heights, according to a survey conducted by the Army Corps of Engineers' Rock Island District this year. Nancy Guyton has lived by the Mississippi River her entire life. She and her husband farm in Annada, a small town on the Missouri side of the Mississippi River. She knows that growing crops on the floodplain comes with some risks. The Guytons’ farm, about 65 miles north of St. Louis, endured major floods along the Mississippi in 1993 and 2008. But since 2008, she’s noticed more flooding. A growing number of studies indicate that climate change is behind more frequent and intense flooding along Midwestern waterways. But Guyton and other riverside residents believe there’s a bigger culprit behind the rising Mississippi: high levees. Across the river and upstream from her farm, Guyton, 72, recently stood on top of a levee that’s a part of the Sny Island Levee System. It looked like a grass-covered mound of dirt that, like a snake, wrapped around an area of cropland. The Sny levee system stretches about 60 miles, from south of Quincy to Belleview, Ill., protecting mostly farmland. It’s the largest levee system in the U.S. Army Corps of Engineers’ Rock Island District. The federal agency released a survey this year that showed 40 percent of levees along the Mississippi River in the Rock Island District have been built higher than they’re supposed to be. It found portions of the Sny to be 2 or 3 feet higher than the authorized level. Since the late 1990s, the Sny Island Levee and Drainage District has been building its levees up to protect against 100-year floods, which have a 1% chance of happening in any given year. But the Illinois Department of Natural Resources is proposing policy changes that could make it legal to add height to larger levees. State regulators released draft amendments this year that would eliminate requirements to obtain permits or a department review for changes made to levees that provide protection against 100-year or worse floods. Drainage districts build up levees and floodwalls to protect what’s behind them. The Sny Island Drainage District’s levees are crucial to keep farmland, interstates, industry and about 1,200 residents from being flooded, said Mike Reed, the district’s superintendent. Reed denied that the Sny levees are higher than authorized by the Corps of Engineers. Nancy Guyton and her husband farm on the Missouri side of the Mississippi River. She also serves as a member of a group called Neighbors of the Mississippi, which has demanded that the Sny Island Levee and Drainage District remove excessive height from its levees. Research has shown that raising levees will cause water levels to rise and worsen flooding. The Illinois DNR’s proposed amendments are an attempt to bring the state’s flood control policy more in line with Missouri and other states that border the Mississippi. The Illinois rules regarding levee construction are relatively more stringent than those of neighboring states. Development in the floodplain can’t increase the flood stage, the level at which water will overflow the river banks, by more than a 10th of a foot. In Missouri, it can’t be increased by more than a foot. 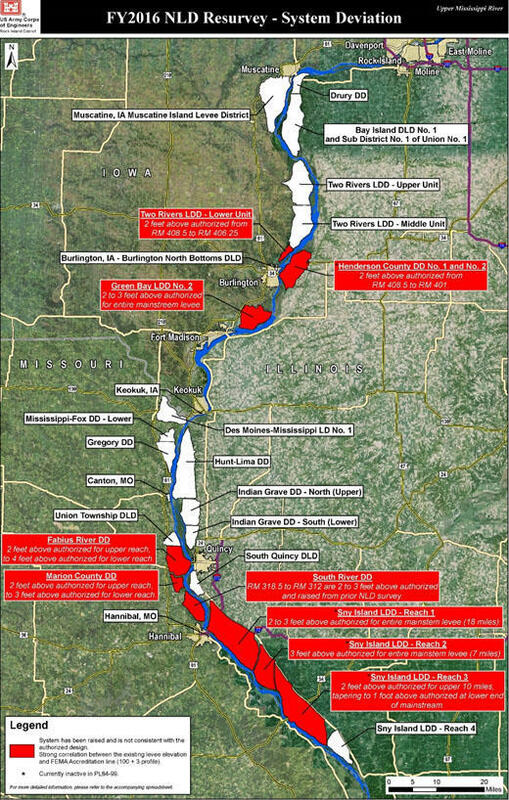 The U.S. Army Corps of Engineers surveyed 28 levee districts in the Rock Island District. The agency found that 40 percent of the levees studied exceeded their authorized heights. The reason elevations are regulated is to avoid a “levee war,” in which a high levee on one side of the river causes people on the other side to build even higher levees to fend off floodwaters that get pushed in their direction. Environmentalists worry that if Illinois loosens regulations on high levees, that could have dangerous results, especially as 100-year flood events become more common due to climate change. Olivia Dorothy, associate director at American Rivers, thinks that drainage districts need to work on lowering levees and setting them back from the river, Dorothy said. American Rivers is a group that advocates for measures to protect rivers and water quality. “We need to be looking at strategies that drive that flood elevation down instead of pushing it higher and higher up and creating a greater risk for people that are living behind levee and people who are living in neighboring communities,” Dorothy said. Illinois regulators have yet to decide on the proposed policy changes. But some, such as Missouri Attorney General Josh Hawley, urged Illinois lawmakers to wait until after the Corps of Engineers completes a study that could shed light on how levees and other structures contribute to flooding along the Mississippi River. But some who live near the river say their experiences show a clear connection between recent river engineering and flooding.